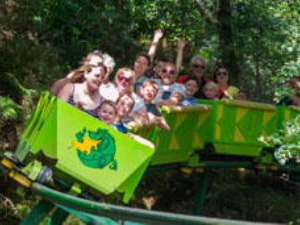 GreenWood Forest Park Theme ParkVoted Best Family Attraction in North Wales for six years running, days out don’t get much better than this! GreenWood Forest Park is set in 27 magical acres, and it’s easy to see why it’s a full day out - discovering woodland adventure, awesome attractions and forest family fun. During February half term and Sept/Oct supervised rides will start at 11am. For winter opening times see website. Prices shown are for PEAK season and will decrease for MID and LOW Season.